As systems grow more complex, the ability to create a full-scale prototype model becomes cost prohibitive. INTERLOCKS® modeling and simulation tool is an affordable alternative. Using discrete event simulation INTERLOCKS can be used during any stage of the product lifecycle and provides the same benefits to the engineering, training, or maintenance process as a full-scale prototype. 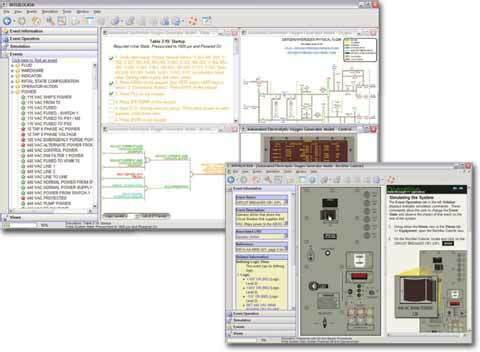 The system design, operations, and component interrelations are clearly represented in the logic, flow and equipment diagrams. In addition, event time sequences and procedural simulations demonstrate normal operation and casualty scenarios. INTERLOCKS is able to provide efficient modeling and simulation solutions through reusable components, events, logic threads, and relational databases and can also embed documents to provide related reference information. Above: Screenshots of the mulitple training aspects of the INTERLOCKS tool.